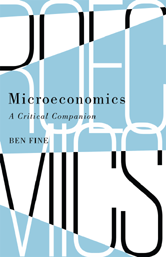 A clear and concise exposition of mainstream microeconomics from a heterodox perspective. 1.9 Appendix: Can the Mainstream be Defended? 3 From Production to Supply and Beyond to General Equilibrium? 3.2 Production and Cost Functions Rule, OK? 3.3 General Equilibrium: A Fantasy Glass, Half Empty or Half Full? 4 Competition Is as Competition Does? 7 Whither Microeconomics: Upside-Down or Inside-Out?